Vinyl flooring offers endless decorating possibilities for your home or business. This flooring product comes in a multitude of styles, colors, and patterns, but the most popular are those that look like hardwood or ceramic tile. Choose a vinyl floor for its realistic beauty. Hardwood would look lovely in your home. Why not get the hardwood appearance with the hardiness of a vinyl floor? Our flooring experts show you how stunning luxury vinyl plank looks in your home. If you would like, we can come to your home or business with plenty of gorgeous samples. High-tech manufacturing techniques create the realistic appearance of wood on vinyl. The embossing is so excellent that you can see the grains of wood with all of its knots and distinctiveness. Not only does manufacturing enhance the appearance, but also the performance of vinyl. This flooring option is ideal for households with children and pets or businesses with heavy foot traffic. You can have beautiful flooring that meets your needs by choosing luxury vinyl tile. 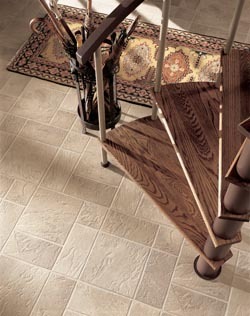 This flooring product offers the timeless appeal of tile and requires little care and no maintenance. In addition, LVT flooring is a cost-effective choice. Choose the style of your luxury vinyl tile that meets your preferences – much the same way you would ceramic, porcelain, or stone tile. LVT is available in any color and shape that best suits the décor of your rooms. Our flooring professionals have design training and experience, so we are ready to serve as your guides in helping you select gorgeous luxury vinyl tile flooring. In addition to the beauty of vinyl tile, this flooring type is durable. Do you have a big family and lots of friends who visit frequently? LVT is up to the challenge. Would you like to install luxury vinyl tile in the bathroom, kitchen, or basement? Because LVT is moisture resistant, this flooring option is perfect in rooms with high humidity. Vinyl flooring is all about ease and convenience for you. Best of all, after your purchase, we make it easy for you to enjoy your new floor. Our in-house professionals provide vinyl flooring installation to ensure a long-lasting and beautiful finished product. Our flooring experts have the skill and know-how to install vinyl so that it lasts for many years to come. Our flooring experts start by installing vinyl over a clean, dry, and level surface. We then then place each piece with precision. It is our job to make sure your flooring adheres properly and avoids damage. Ask us about our Lifetime Installation Guarantee. If you have concerns about your flooring, we fix it free of charge. Contact our flooring store at (321) 426-1237 to learn more about the benefits of vinyl flooring. We proudly serve customers in Melbourne, Florida, and the surrounding area.